There are a few mac usage questions regarding escribe spread around. To consolidate them, here is a starting point. You can run various "guest" operating systems on your mac. You will need to run a guest version of windows in order to use escribe. The simplest way to do this is with a free program called Virtualbox. This allows you to install and run many different operating systems that run virtually on your system. Prior to starting down this path, get accustomed to the lingo: your mac is the "host" and the operating system you run virtually will be called the "guest". Got it? OK. While you are there, download the extension pack listed as for "all supported platforms". When the DMG for OSX has downloaded open it and run the install package as you would for any other program. After it has installed, open your applications folder, and right click virtualbox and select open...you will have to do this the first time as it is a program downloaded from the Internet...for future uses you can open it normally. Once open, use finder and go to your downloads folder and double click the extension pack you just downloaded. Virtualbox will open it and add it to its program. If you want to skip the install (though I recommend it), you can download pre-built virtual box images from Microsoft. These are for testing Internet Explore but work fine for running escribe. If you go the download route...they are large files. Once the download is complete, open Virtualbox and go to "File" then select "Import Appliance" (another bit of lingo is that a complete "guest" OS is called an appliance). Navigate to your downloads folder and pick the pre-setup virtualbox image you downloaded. This will bring in the downloaded install of the version of windows you selected. Once it is imported, select it and then choose "start". It will boot your guest appliance in a window. From there you will have a fully functional system that you can use to download escribe. The first thing I like to do is install the VirtualBox drivers for the host OS, for windows, you click "Devices" on the menu tab while in your guest windows OS then "Insert Guest Additions CD Image". This will prompt you to install drivers the MS way and should run its course with little issues. Once installed, you will need to reboot the guest OS. If you install your own guest OS or download it, you will need to authorize it to allow it to access your USB devices. 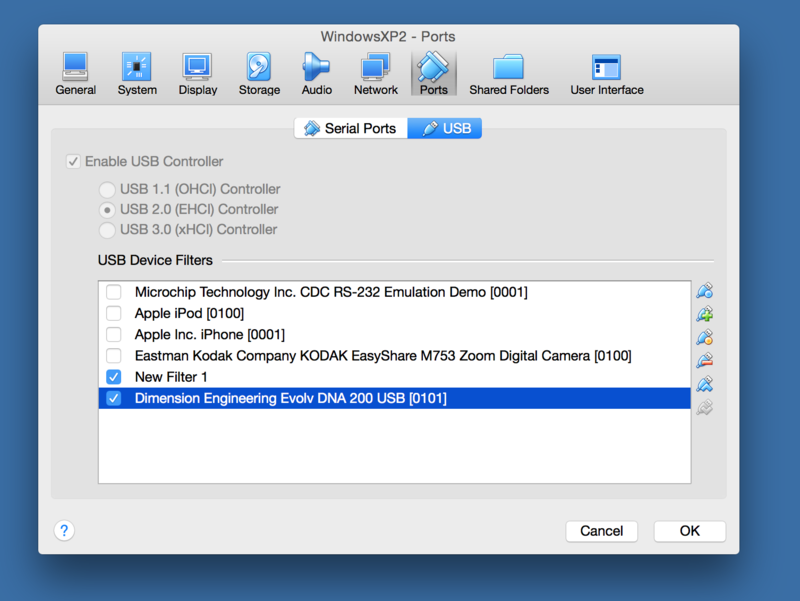 The first step to doing this, with the guest OS off, is plugging in your DNA200 so that your mac recognizes it, then go to Virtualbox, select your new guest operating system and on the right scroll down to "USB" and click it to make changes to the USB configuration of the guest OS. 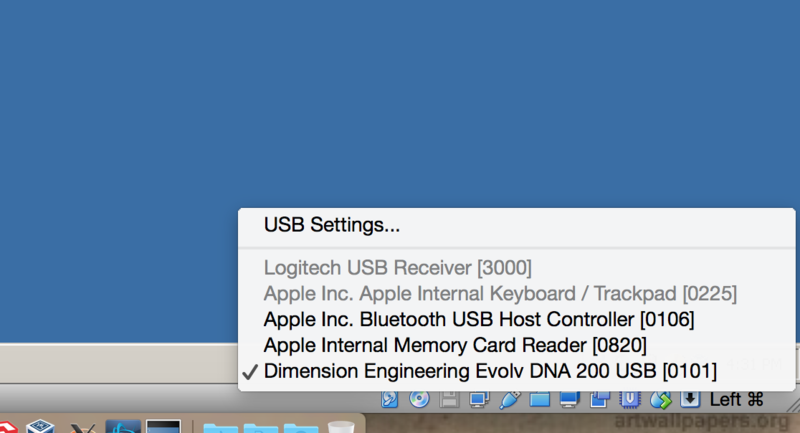 Click the plus icon on the right to add a USB device to this build and then check "Dimension Engineering Evolv DNA 200 USB " so this device can be accessed by the guest OS. From there you should boot your guest version of windows. Then go to the "Devices" menu item in the virtualbox window running your version of windows and select "Insert Guest Extensions CD Image". This will put a fake CDROM into your guest operating system that has drivers for the hardware that the virtual interface emulates. Allow windows to auto run this CD and install the software, clicking yes to any "trust this developer" questions. Reboot your windows install, plug in your DNA200 and open esribe. I have found that I have to frequently issue commands twice (Connect and Download or Upload may fail the first time, but works the second). This is due to a timeout issue programed into escribe. Later versions of escribe have increased this timeout and this issue is diminished. If you have questions you can post them here and I will try and help. The process sounds more complex than it actually is. You can also use VMFusion from VMWare, parallels from Apple or bootcamp from Apple. I do not use either of those and can not offer assistance on them, but perhaps others will join this thread who can. Thanks for the excellent writeup! This should help a number of people. You're my boy, Blue! Used your method and EScribe on my MBAir is working like a champ! Never used VirtualBox before and got my device to sync on the first attempt. I've been using parallels without a hitch since I got my mod. I was having issues with parallels in the beginning. Then, of course, that was with Win 10 and before the updates. Great...it sounds like we have some parallels knowledge here too in case there are questions. Thanks for the mention of Fusion. I am installing it now to give it a try. My only reason I always go back to VirtualBox is that the virtual guest OS's are transportable across platforms (I can move a given guest OS to Linux or Windows or my mac). Given that I historically ran Linux on my mac it was a great fit (though I have gone back to OSX for the last few years). So the Mac and the guest OS see the mod, but escribe won't? If escribe in your guest OS sees your DNA200, and sees your friends DNA200, will open your friends DNA200, but will not open your DNA200, then I am inclined to think it is something specific to your chip. My only thought is to use another computer to put the latest firmware on your chip. I ran into a similar situation trying to connect a second mod. I did several things so I'm not exactly sure which step or combination of steps solved the problem! 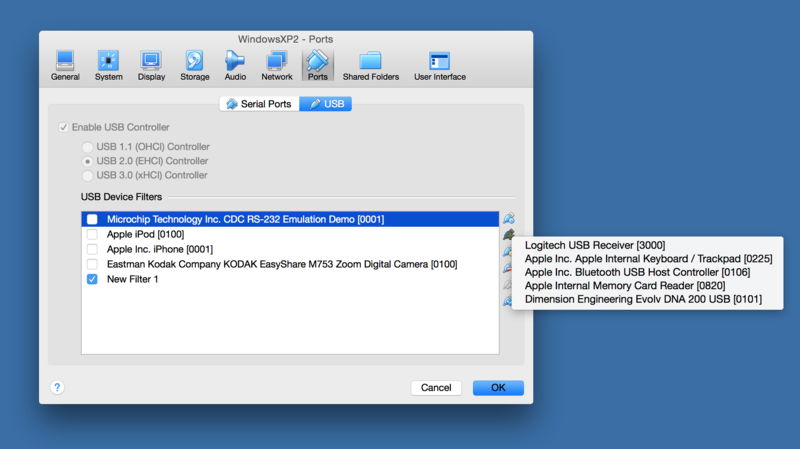 It may be that you need to install the USB port in the guest OS for each mod due to variations in port assignments. To test, I would delete the USB port assignment from the Guest configuration then set it up again with the new mod. I may have gone the long way doing it but that's essentially what was accomplished. In the end, it did work. I know this is mac support, and what I'm trying to do get this to install under linux (Ubuntu 14.04). . . but. . .Mac OS is basically unix too. . . This is what I get with lsusb: I think the DNA is device 13. . . But it may be too new to have it. Even if corrected I am not 100% certain it would solve the issue. However, I can't imagine that the escribe software is looking for the text string of Vendor and Device label rather than the hexadecimal reverence to the same. Thanks. Yeah, this is an OS, issue not an escribe issue per se. 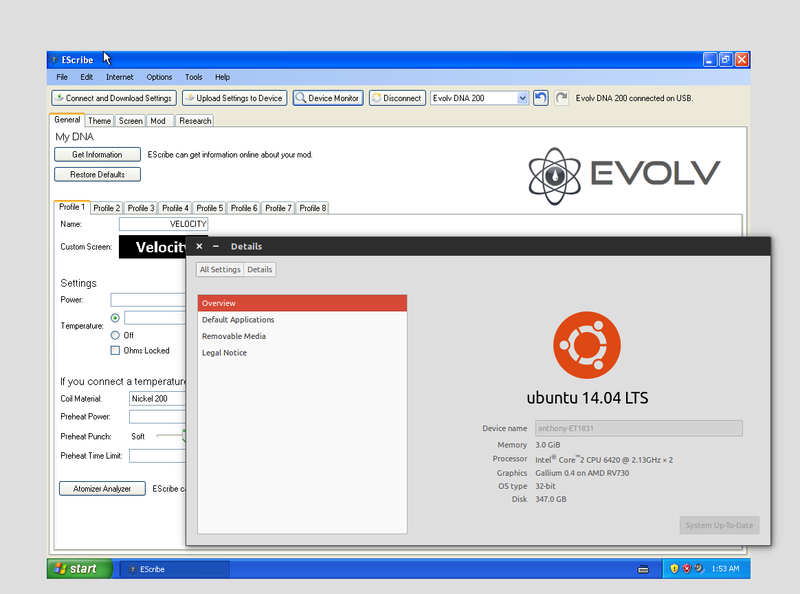 Need Ubuntu to see the DNA. . . and it is, it's just not talking to it. I think I need to find out what device library contains the API for the DNA200, if it's even in Linux-land. I may need to bother people over there. Edit, updated USB library. Still not talking. No time before work to fiddle in terminal. I'll deal with it when I get home from work. lsusb just gets a maintained list of VIDs and PIDs. It doesn't query the device. 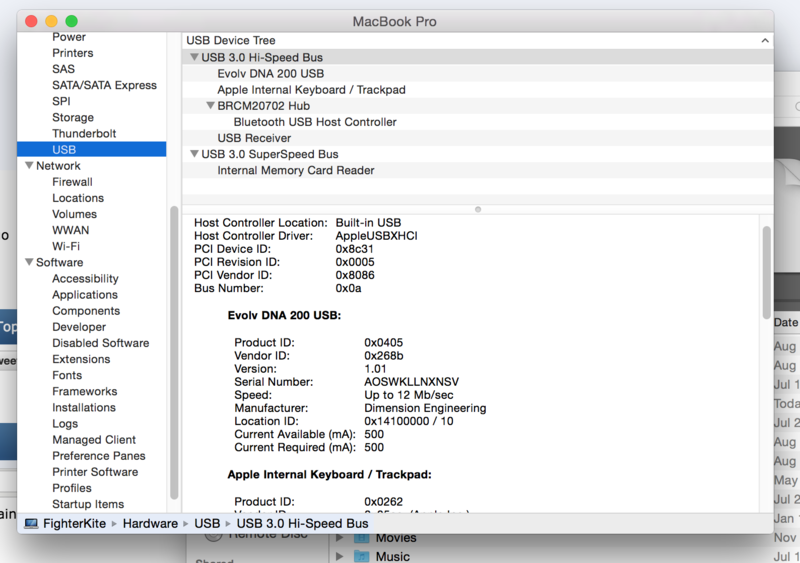 Whether it shows or not isn't related to whether USB is working. 268b:0405 is the DNA 200, yes. Thanks James. Well, I have a work around. Installed virtualbox and made XP virtual machine. Enabled the USB etc in VB. I feel dirty for having to do this but at least I don't have to "actually" boot into windows just to diddle with my mod. Every thing seems to work just fine. So what were you trying before? A wine variation? I used Ubuntu for a few years, but switched to macs when they went to Unity.